It’s not difficult to imagine that in ten years or so, a story about the HS Pro Studio Showing might begin with something about some of the great dance careers that began there. It’s not just that the Hubbard Street Professional Program, founded this past September, is designed and managed by one of the world’s great dance organizations, either. Hubbard Street’s Director of Artistic Training, Alexandra Wells, brings her own more than convincing credentials to the program’s promise. 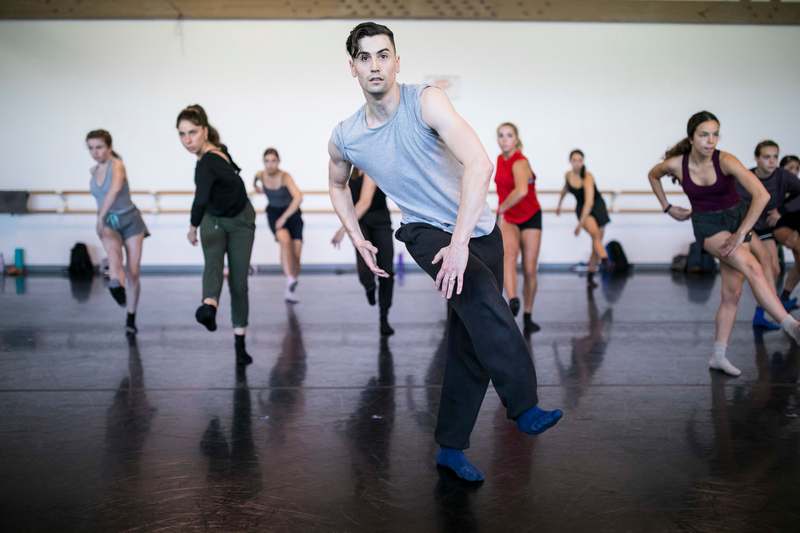 Yet as probable as it already seemed that the Hubbard Street Professional Program would be turning out great dance artists, that possibility seems even more likely after their first Studio Showing. Studio showings are always unique events. The HS Pro Studio Showing took place Friday, December 8 in Hubbard Street’s spacious Studio A, and although the space is larger and more prestigious than most rehearsal spaces, the program still had the close-up, inside-the-dance feeling that can give a studio showing such a special appeal. Very often in presentations like this, choreographers are able to focus more vividly on a specific concept in their work, ideas that would often be lost in transitions in larger settings. The evening began with a series of four short dance films by HS Pro’s Morgan Frasier, in each of which Frasier focuses on a very specific, well-imagined aspect of solo dance. “With each of these films, I was trying to find new ways to utilize the studio space,” Frazier explains. “I wanted to offer different perspectives and ways to reinvent and transform the setting.” In doing so, she explores a completely different kind of collaboration with the soloist in each of the films, including a very stylized, “creature-esque” (Frasier’s own description) solo by Emily Wohl in CURIOUS.ink, and another (turning you blue) by Haley Heckethorn shot mostly from directly above. Frasier made the third film, slinky.she, to showcase the movement style of Nicole Salerno, in which together they explore the idea of movement in a mirror, but with the mirror controlling the movement. In Frazier’s fourth film, Study of Movement, she and Branna Primrose created movements that each start from a pose in model Coco Rocha’s A Study of Pose. The HS Pro Studio Showing included three other works choreographed by HS Pro performers, and like Frazier’s films, each of them showed one of the best parts of seeing dance in a studio setting. Very often in presentations like this, choreographers are able to focus more vividly on a specific concept in their work, ideas that would often be lost in transitions in larger settings. Nicole Salerno’s 0.5%, for example, explored the idea of empathy through the interactions between a trio of Hanna DiLorenzo, Haley Heckethorn and Emily Wohl. She begins with the remarkable idea of a close-partnered duet, but with the third dancer precisely emulating the movements of one of the partners, and goes on to build an engaging exploration of how it is that we feel what others feel. Melissa Panetta and Brianna Penrose presented a larger ensemble work called Spectrum of Chaos. “Our piece concentrates on the importance of individuality, with each dancer representing a different color,” Panetta explains. “If a color is a combined with another color, it forms a new color and a new form of beauty.” She goes on to point out that when all colors are combined, it creates the absence of color, so Spectrum of Chaos is designed as a series of solos, duets, and trios, with little to no unison. With a score edited smoothly and effectively by Primrose, and with Panetta and Primrose joining Abdiel Figueroa Reyes, Candace Gordon and Abigail Purcell in the performance, Spectrum of Chaos was a collage of beautifully designed movement ideas. The first part of the showing concluded with Haley Heckethorn and Emily Wohl’s Grounded Misconception, in which they also performed. Once again, the movement was creative and engaging. Set to a laid back Nina Simone live track, Heckethorn and Wohl perform a imaginatively conceived duet of near unison, breaking from that unison just often enough to light it with a truly unique perspective. One of the most engaging parts of the HS Pro Studio Showcase was actually the remarks that were interspersed among the works. Each of the HS Pro choreographers spoke briefly before their work, adding that in-depth look at process you can never get except at a studio showing. Alexandra Wells timed a series of really thoughtful ideas about professional training around costume changes and breaks between works, keeping the showing on an easy to follow trajectory. One of the most engaging parts of the HS Pro Studio Showcase was actually the remarks that were interspersed among the works. Especially engaging was Shannon Alvis, who staged excerpts from Nacho Duato’s Palmeras with Sarah Cullen Fuller. Both Fuller and Alvis performed the work with Hubbard Street, and their ability to recreate the smooth intensity of a Hubbard Street performance on the full HS Pro ensemble was exceptionally impressive. Alvis provided all kinds of back stage insights into the work and the process of remounting it that made the HS Pro performance all the more enjoyable to see. In addition to the full ensemble excerpt from Palmeras, Alvis and Fuller staged a solo from Duato’s Cor Perdut that was performed in sequence by three of the HS Pro dancers: Candace Gordon, Brianna Penrose, and Gaby Diaz. Yet another reason to see a showcase, especially a high calibre one — there’s nowhere else that you could see three talented artists perform exactly the same movement, so capably and yet so individually. The Showcase concluded with Jonathan Alsberry’s Chew, a rowdy and inventive adventure that featured all of the HS Pro company. Despite the work’s large ensemble scope, Alsberry managed to interweave all kinds of precise interactions into his design. The Hubbard Street Professional Program’s HS Pro Studio Showing was informative, enjoyable, and very promising. There’s one more performance of the HS Pro Studio Showing, on Monday, December 11 at 2:30pm. The performance is at the Hubbard Street Dance Center, 1147 W. Jackson Blvd, Chicago 60607.